Dunlop is one of the world’s leading manufacturers of high and ultra high performance tyres with an impressive track record of motor sport successes. 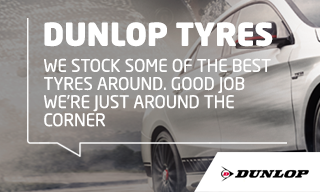 Dunlop’s extensive racing experience has led to innovative technologies for tyres designed for everyday motoring. Always looking to maximize driving pleasure, Dunlop offers all types of motorists the performance and durability of the latest tyre technologies, including tyre’s with RunOnFlat technology, which is fitted to award winning vehicles such as the Mini, BMW 1 Series, 3 Series, 5/6 Series, X5/X6 and others. For over 125 years Dunlop have revolutionised the transport industry across the world. ATS Euromaster are proud to carry specialist Dunlop Car, 4x4 and SUV ranges throughout our UK service centres. For further information on Dunlop Tyres use the ‘Find Your Tyres’ tool or visit your local ATS Euromaster centre where our experts can help select and fit the right product for your vehicle. Sport Maxx - Developed for mid-class and luxury vehicles. The SP Sport Maxx tyre provides superb performance at high speeds and excellent handling on all surfaces. Enhanced levels of grip on the road and highly responsive braking power in wet and dry conditions ensure a smooth driving experience. Stability and precision come as standard with this class of tyre. Expect high aquaplaning resistance, precise cornering control, prolonged tyre life and a quiet, pleasant ride. Sport Maxx RT - Designed with high performance cars. The Dunlop Sport Maxx RT utilises the latest in motorsport innovations. Its adaptive compound allows for the tyre to mould to the surface of the road for exceptional grip and stability at high speeds. Combined with shorter braking blocks the Dunlop Sport Maxx RT offers phenomenal stopping power, everything the driving enthusiast could need from their high performance tyre. Dunlop Sport BluResponse - Suitable for all types of passenger car. This tyre offers fantastic grip without compromise. The specialist polymer compound gives better grip and handling on wet and dry roads. Designed for high performance driving, the asymmetric tread design ensures stability, even wear, precision and reduced rolling resistance. With lower noise pollution and a fuel-saving aerodynamic shape, this tyre responds quickly and precisely for a smooth, comfortable, quiet drive.